Atherosclerosis now is more considered as athero-thrombosis and Aspirin is the single most used preventive treatment but offers only a 19% relative risk reduction during the long term. Use of anticoagulant has been tried in Warfarin and found to be more effective, but increases bleeding and is difficult to use. 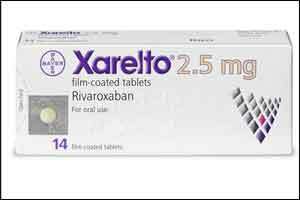 Rivaroxaban is a selective direct factor Xa inhibitor that is used to prevent and treat venous thromboembolism and to prevent stroke or systemic embolism in atrial fibrillation ATLAS 2-TIMI 51, has shown that Rivaroxaban 2.5 mg twice daily is safer than warfarin and has reduced morbidity and mortality in patients with recent acute coronary syndrome. The COMPASS trial tested whether rivaroxaban alone or in combination with aspirin would be more effective than aspirin alone for secondary cardiovascular prevention. A total of 27,395 patients (mean age, 68 years; 22% female) with stable atherosclerotic vascular disease were randomly assigned to receive rivaroxaban (2.5 mg twice daily) plus aspirin (100 mg once daily) or rivaroxaban 5 mg twice daily monotherapy or aspirin 100 mg once daily monotherapy. The trial was conducted at 602 centers in 33 countries. The majority (90%) of participants had prevalent coronary artery disease, 27% had peripheral artery disease, 38% had diabetes, and 90% were taking lipid-lowering medications. In February 2017, the Data Safety Monitoring Board recommended that the rivaroxaban plus aspirin arms be stopped because of a clear superiority for the combination of rivaroxaban and aspirin over aspirin alone. The combination of rivaroxaban and aspirin, compared with aspirin alone, reduced the primary MACE endpoint of cardiovascular death, stroke, or heart attack by 24% (hazard ratio, 0.76; p<0.001). This difference was driven by a 22% reduction in cardiovascular death (HR, 0.78; p=0.02), and a 42% reduction in stroke (HR, 0.58; p<0.0001), with no significant difference in MI. Rivaroxaban plus aspirin also reduced the risk of all-cause mortality compared to aspirin alone (HR, 0.82; p=0.01). Rivaroxaban monotherapy was not superior to aspirin alone. The addition of rivaroxaban to aspirin increased major bleeding, but did not increase fatal bleeding, nonfatal intracranial hemorrhage, or nonfatal other critical organ bleeding. For the net clinical benefit endpoint combining the primary endpoint and severe bleeding, rivaroxaban plus aspirin was still superior to aspirin alone (HR, 0.80; p=0.0005). So, it is suggested that Aspirin as anti-thrombotic is also combined with anti-coagulant the preventive effects shall be much more. The researcher concluded that very low dose rivaroxaban plus aspirin reduces cardiovascular death, stroke, and MI in individuals with stable coronary artery disease. The issue is also studied for peripheral artery disease (PAD) in COMPASS PAD arm. After a mean follow-up of 21 months and consistent with the overall COMPASS findings, MACE was significantly reduced with combination therapy compared to aspirin alone (HR, 0.72; p=0.005). In addition, major adverse limb events (MALE; severe limb ischemia leading to an intervention, angioplasty, bypass surgery, amputation, thrombolysis or major amputation above the forefoot) were significantly reduced (HR, 0.54; p=0.005). The incidence of major amputation above the forefoot was reduced 70% (HR, 0.30; p=0.01). The clear benefits of combination therapy were consistent in those with symptomatic PAD, PAD only of the lower extremities, and carotid artery disease. The comparison between combination therapy and rivaroxaban alone was not significant. J Eikelboom, Presenter; E Braunwald, Discussant. ESC 2017 Late-Breaking Clinical Trial: COMPASS: Cardiovascular outcomes for people using anticoagulation strategies: Primary results. ESC 2017. 27 AUG 2017. S Anand, Presenter. ESC 2017 Late-Breaking Clinical Trial: COMPASS: Results in patients with CAD and in patients with PAD. ESC 2017. 27 AUG 2017.